Ah, the family holiday—an occasion for a cocktail if we’ve ever heard of one. But all too often the holidays mean you’re limited to someone else’s liquor cabinet. Plastic handles of vodka, and brandy that is well past its prime await you, but for occasions such as these we offer two words of comfort: Jack Daniel’s. If there’s any single bottle that someone’s likely to have kicking around in his or her liquor cabinet, it’s Jack. But just because it’s common doesn’t mean it can’t make a classy cocktail. You don’t need us to tell you how to make a Jack and Coke (or its perhaps more sophisticated cousin, Jack and Ginger), so we thought we’d help you with a few more creative ways to take the edge off your relatives. Once upon a time, Jack Daniel’s was so in-demand that it was on allocation: There wasn’t enough to go around, so bars and liquor stores could get their hands on only a limited number of bottles. Back in those days, our friend Jack was something of a status symbol. And there’s no classier way to mix the Black Label than as a simple Manhattan. Here’s a three-ingredient cocktail that’s dead simple but dressed up enough for the holidays. Instructions: In a mixing glass with ice combine 2 ounces of Jack Daniel’s, 1 ounce of sweet vermouth and a dash of Angostura bitters. (In some cocktails, bitters are optional; in cocktails this simple, you really do need them.) Stir together until well-chilled, then strain into a cocktail glass. Garnish with a brandied cherry. 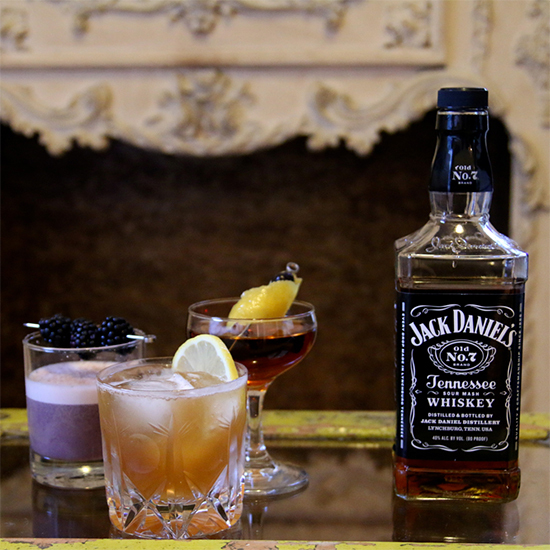 Not to toot our own horns too much, but this simple drink once won a Jack Daniel’s cocktail contest. It’s named after one of the saloons that Jack himself once owned in Lynchburg, Tennessee (you did know that Jack Daniel was a real person, right?) and it’s ideal for fall: a whiskey sour with apple cider vinegar for tartness and maple syrup to sweeten it up. Instructions: In a cocktail shaker with ice, combine 2 ounces of Jack Daniel’s, ¾ ounce of fresh lemon juice, ¼ ounce apple cider vinegar, ½ ounce of maple syrup and two dashes of Angostura bitters if you have them. Shake that all together and strain it into a rocks glass with fresh ice. Top with sparkling cider—either nonalcoholic or hard cider (we like the boozy stuff better). Even though it has zero ice cream and minimal sugar, this shaken drink is about as close as a cocktail can get to a milk shake. But it’s our kind of dessert drink: boozy, fun and not too sweet. Don’t be put off by the whole egg in here, it’s what gives the cocktail its light, creamy texture. And the fruity, banana-y flavors lurking in the mellow sweetness of Jack Daniel’s are a perfect match for the real fruit in here. Instructions: In the bottom of a cocktail shaker, muddle 5 whole blackberries. Add 2 ounces of Jack Daniel’s, ¾ ounce honey syrup (equal part honey dissolved in hot water, so it blends easier) and a dash of Angostura bitters if you have them. Crack in a whole egg. Shake all that together without ice, then add ice and shake until well chilled. Double-strain (strain through both the cocktail shaker’s strainer as well as a fine mesh strainer) into a cocktail glass. Garnish with grated nutmeg (fresh, if you can) and more blackberries.